Could Twigg be set for debut against Glebe? Gary Twigg could be in line to make his Coleraine debut in tonight’s (Tuesday) friendly against Glebe Rangers. The pre-season game, which kicks off at the Riada Stadium at 7.45pm, sees Oran Kearney’s men take on the Ballymena Premier Intermediate side. “It will be a good test for us,” said Glebe boss Jason Wilmont. 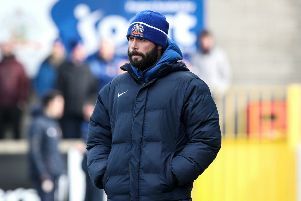 “We have been looking good in training, but the boys want to play games and there’s no bigger game round here for us than Coleraine. “Hopefully we get a decent crowd on the night, and with Gary Twigg maybe making his debut for them I’m sure there will be a few more coming along. Twigg signed a one-year deal with the Bannsiders on Saturday morning following his departure from Portadown.